Q1 2019 MEMBERS COMPETITION: Which will you pick if you win €1,000? With either of these super prizes, one thing is for sure, you’ll certainly be going places! Every time you scan your Dulux Trade Points card, every time you convert your Trade Points to Rewards, and when you log into the Dulux Trade Points App – you have a chance to become our lucky quarterly winner. Competition closes 31st March 2019. This competition runs from 1st January 2019 to 31st March 2019. After all entries are counted, every member who claimed a reward, scanned their card or logged into the Dulux Trade Points App will be sent an email or SMS on 3rd April 2019 with a competition question to answer. Answer this question before 5pm, 5th April 2019 and you could be our lucky winner. Winner will be notified by 9th April 2019. Full terms and conditions can be viewed below. 1. By entering into the Dulux Trade Points Quarterly Members Competition (the “Competition”), participants agree to be bound by the following terms and conditions. 2. This Competition is open to residents of the Republic of Ireland aged 18 and above who are registered members of the Dulux Trade Points Dulux Loyalty Programme (the “Participants”) and excludes employees of the Dulux Paints Ireland Limited group of companies, their families or agents or any other person connected with the running of this Competition. 3. In entering the Competition, Participants confirm that they are eligible to do so and eligible to claim the prize. Dulux Paints Ireland Limited of Shandon Works, Commons Road, Cork, T23 ET21 (the “Promoter”) may require Participants to provide proof that they are eligible to enter the Competition. 5. This Competition will run in 2 stages. Participants can earn Entry Rights from 1st January 2019 until 31st March 2019(“Quarter”). At the end of the Quarter, Participants will be contacted (via the email address or phone number they have used to register with the Dulux Trade Points Dulux Loyalty Programme). Participants can then enter the Competition draw by correctly answering the entry question during the period from 3rd April until 5pm, 5th April 2019 via SMS or email. All entries must be received before 5pm, 5th April 2019 (the “Closing Date”). Entries received after the Closing Date will not be accepted. 7. Participants can earn multiple Entry Rights (and consequently a number of entries) per Quarter. 8. No third party or joint submissions will be accepted. 9. Incomplete entries will be disqualified and the Promoter accepts no responsibility for entries that are incomplete, illegible, damaged, delayed or lost or for technical errors. Proof of submission of an entry is not proof of receipt. Entries will become the property of the Promoter upon submission. 10. The Competition winner will win, at its option either: • €1,000 Aer Lingus Voucher or • €1,000 Circle K Voucher. Supplemental Terms and Conditions apply to the prize choice, as set out below. 12. The prize winner will be drawn at random by an independent person from all correctly completed and valid entries on 8th April 2019. 13. The prize winner will be notified by phone or email by 9th April 2019. If any winner is unable to be contacted after a reasonable period of time, a replacement winner may be drawn at the Promoter’s discretion. 14. The prize winner’s name and county can be obtained by sending a stamped addressed envelope to Dulux Trade Points Competition, Marketing Dept, Unit J, South City Business Park, Tallaght, Dublin 24 OR an email to marketing@dulux.ie within 30 dates after the date of the closing date of the Competition. 15. The prize is subject to availability and the Promoter reserves the right to substitute a prize of equal or higher value in the event the original prize offered is not available due to circumstances beyond its reasonable control. 16. No cash equivalent or alternative will be provided for any prize awarded under the Competition and prizes are not redeemable for cash. 17. The prize is non-transferable, non-negotiable, non-exchangeable, and non-refundable and cannot be used in conjunction with any other offers or promotions. 18. The Promoter reserves the right in its sole discretion, with or without cause to immediately exclude any Participants in this Competition or withhold any prize where it has a reasonable suspicion that a Participant has breached these terms and conditions and/or has submitted incorrect, illegible, fraudulent or other invalid or improper information. 19. In the event of a dispute the decision of the Promoter is final and no correspondence will be entered into. 20. By participating in this Competition, all Participants are deemed to give their consent to appear in future publicity materials or other promotional events and activities related to this Competition. 21. By participating in this Competition, Participants acknowledge and agree that certain personal data relating to them (including their name and geographical location) may be disclosed to third parties. 22. The Promoter reserves the right to alter, amend, cancel or withdraw this Competition in whole or in part, temporarily or permanently, at any time without prior notice for circumstances beyond its control. 23. To the fullest extent permitted by law, The Promoter excludes: • all conditions, warranties and other terms which might otherwise be implied; and • any liability for any loss or damage (whether direct or indirect) or consequential damage of any nature in contract, tort (including negligence) or otherwise caused by the acceptance of the terms and conditions or in connection with this Competition. 24. Please retain these terms and conditions for future reference. Alternatively further copies are available by sending a stamped addressed envelope to the Promoter. 25. This Competition is governed by the laws of Ireland and is subject to the exclusive jurisdiction of the Irish courts. 26. Data protection: the Promoter is committed to protecting the privacy of Participants. Any information collected in connection with this Competition will only be used by the Promoter or its agents for the purposes of marketing or administering this Competition. 27. “Dulux” and “Dulux Trade” are trade marks of the AkzoNobel Group of Companies. Vouchers can only be redeemed at aerlingus.com in respect of flights operated by Aer Lingus and cannot be redeemed for bookings that involve travel on flights operated by partnership airlines. Vouchers cannot be redeemed through the Aer Lingus reservation offices, at airport ticket counters or at travel agents. Vouchers can only be redeemed on aerlingus.com against the cost of Aer Lingus flights (including fares, taxes, charges and selected fees). Vouchers can only be redeemed against bookings in the currency of issue. Only one voucher up to a maximum of €500 may be used per transaction. In order to redeem a voucher the person whose name is on the voucher as specified by the purchaser at the time of purchase must be a member of the party being booked. Vouchers are transferable and this can be done via the Change Name function in Manage my Voucher on aerlingusvouchers.com. First name, surname, e-mail address and delivery date can be changed; all other items remain as per the original voucher. Vouchers cannot be redeemed as part of AerClub Travel Reward bookings. Bag fees / Advance Seat Selection fees / Lounge Access fees may be paid for with vouchers provided they are pre-booked at the same time as the purchase of the flight(s). Vouchers cannot be used in respect of these fees if they are booked subsequently through the Manage Booking facility. Vouchers may not be used for other products (e.g. car hire, hotels, travel insurance). Vouchers will not be redeemed or exchanged for cash. Aer Lingus reserves the right to cancel bookings or request alternate forms of payment if a fraudulently or improperly obtained voucher is redeemed at aerlingus.com. Any credit remaining following redemption of the voucher may be used within the original validity period towards future flight purchases. Vouchers cannot be offset against bookings which have already been made. Vouchers cannot be applied towards change fees, or additional fare for reissued or partially used tickets. Vouchers may not be used towards the purchase of food or beverages on board. Vouchers cannot be used to make or confirm a Price Lock or Deposit booking. 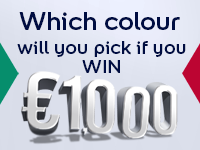 Prize is valid for a €1,0000 Circle K fuel card. Circle K fuel cards will be supplied in € and can be used as full or part payment towards fuel in Republic of Ireland only. Vouchers will be sent to the address registered with Dulux Trade Points. Deliveries will be made using An Post/Royal Mail services. All orders will be sent by registered post and will require a signature on arrival. Vouchers will normally be received within 10 working days. Where possible we will try to meet all delivery requirements but neither Dulux nor TLC Marketing shall be liable for any loss incurred either directly or indirectly by failure to meet the delivery date and time indicated at the time of order being placed. ‘Loss’ in this instance includes loss of profit, costs, damages, charges or other expenses. Risk will pass to the customer upon delivery. Neither Dulux nor TLC Marketing can be held responsible for lost, stolen or damaged fuel cards following delivery to the recipient. The fuel card will NOT be replaced or refunded if lost, stolen or damaged. Neither Dulux nor TLC Marketing is responsible for fuel cards used without your knowledge. Circle fuel cards cannot be exchanged for cash and cash refunds will not be available for products purchased with this card. Fuel cards which are defaced, altered or cancelled will not be accepted. The re-sale of fuel cards is strictly prohibited. The promotion is not valid in conjunction with any other promotion and is subject to availability. There are no cash or other alternatives. The promotion is not open to employees of TLC Marketing or Dulux. Fuel cards are valid for 1 year from issue. Q3 2018 MEMBERS COMPETITION: Get in Gear to win an exciting €1,000 prize!